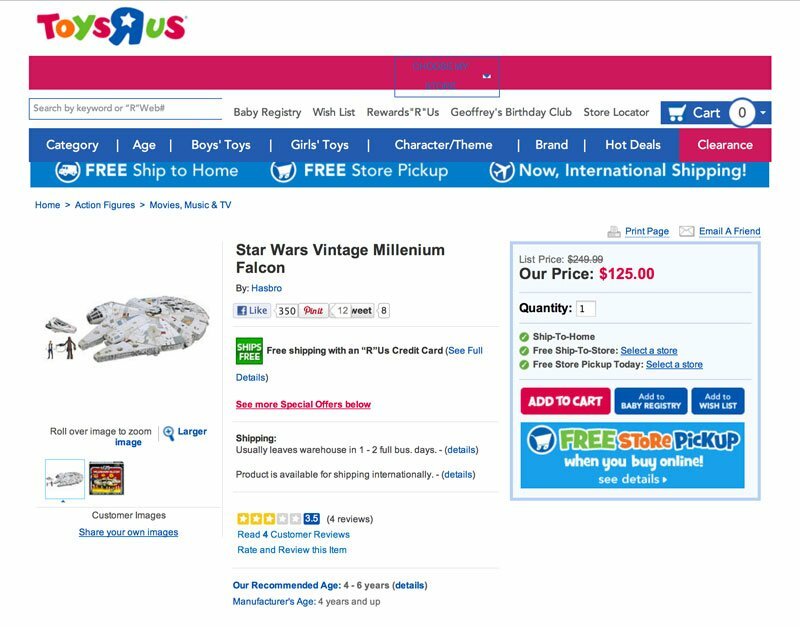 ToysRUs Vintage Falcon 50% Off! For folks waiting for a further price drop on the TRU exclusive Vintage Collection Millennium Falcon, it's even cheaper...like half off! The Vintage BMF is now on sale for $125 (regularly $249.99)! Get yours today by clicking here! UPDATE: Sadly, it looks like it was a snafu by TRU and the Falcon is once again back up to regular price. The M.T.T. was also marked down to $90 for a short while and is now back to the "regular" sale price of $125.99. If it's any consolation, the Vintage BMF is on sale this week for $199.99 (at least in stores, for now.) It was almost too good to be true that the BMF would be on a regular sale for that amount, but sometimes you gotta just jump on it before it's gone and done.